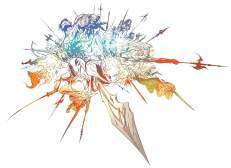 Final Fantasy XIV - What can one expect from this Square-Enix's next-gen MMO? In this blog I talk about SE's new upcoming MMO 'Final Fantasy XIV (Online)'. The subject today is the endgame structure found in FFXI and later, perhaps in FFXIV as well. There are many types of events in FFXI, so I'll go through them in order; by looking at the more current events we can also find out what the FFXIV endgame might consist of later. The 'sky' system was one of the first endgame events in FFXI. It consisted of tiers of strong monsters you needed to kill to progress. For the first tier the monsters had to be camped, since they would repop only after several hours had passed since they were last killed. Each of them would drop an item needed to pop the next tier, the four sky gods. These four gods would, when killed, drop a seal needed to pop the final monster in the system, Kirin, as well as fairly good equipment and synthesis items. At first, to beat these monsters you needed at least 18 people, and for Kirin having at least 25 people was almost mandatory. The 'sea' system was the second tier-based system implemented in FFXI. In this system, too, you had to kill harder and harder monsters to progress to the next tier. The system is considered to be inferior to 'sky' in many aspects however. Monsters did no longer drop synthesis materials, and while the equipment was fairly good still, the monsters could only drop one to two of them compared to 'sky' gods' several pieces. The drop rate is quite low for the first tier, but got better as you progressed further. However, there is one very significant difference compared to the sky system. Absolute Virtue (AV) is the Kirin of sea: the final tier monster in the system. Unlike Kirin, AV has never been killed the 'right' way. As it is right now (even after several adjustments), no group can survive against his attacks while dealing enough damage. The development team has said that there is a trick to killing it, but nobody has found it as of today (even after several hints were given, and a video made by the dev team was released). Al'taieu, or often called the 'sea'. The two systems have some similarities though. Both events require you to progress through the story to unlock the main area where the monsters are fought. The way monsters are popped requires camping in both events, which can be very time consuming. In these aspects the third tiered system differs quite a bit from it's predecessors. Zeni Notorious Monsters (ZNM) are popped using different items you get by trading pictures of normal monsters to an NPC. The NPC will then give you 'zeni' points based on the quality of the picture (level/hp/type of monster, and from which angle the picture was taken). Every monster gives some amount of points, but the NPC has a preferred monster type that changes every few hours. That monster type usually gives the most points. Usually for about ~15 pictures you get enough zeni to pop a tier 1 monster. You can only trade 10 pictures per a RL hour to the NPC though. The system requires no camping whatsoever, and once you get the required item to pop the monster using zeni, you can go to the designated pop area and start fighting as soon as everyone is ready. The first tiers don't require many people to clear them; most of the time less than 6 players are enough to kill the monster, and in some cases even one player can succeed with relative ease. Unlike sea monsters, ZNM's drop equipment like their sky counterparts, and the higher tier ones some synthesis materials as well. However, the pop items required to proceed to final tier do not have 100% drop rate like the sky gods do. The drop rate is about 10%~, and it can take a long time to get all 3 pop items. Unlike sky and sea monsters, ZNM's are scattered around the expansion areas and there is no mission requirement to be able to do it. It is linked to a minigame released earlier though, the Pankration, which you may have to do a bit first before you can start gathering the points. The final tier monster in the system, called Pandemonium Warden, has similarities to AV. At first, SE thought that both monsters should take around 18 hours to kill. However the negative reaction from the playerbase made SE change the monsters to have a 2 hour time limit in which you have to kill them. Unlike AV, PW has been able to be killed by many groups, but it is still quite a challenge to most of the playerbase. Pandemonium Warden, the final monster in the ZNM system. So, what conclusions can we draw from this? If FFXIV endgame will have a tier system, it will most likely become a mix of sea and ZNM. Popping monsters might be point based instead of time, the lower tier monsters could be killed with only few players or solo, and there will most likely be a monster similar to AV or PW; let's hope for the latter. 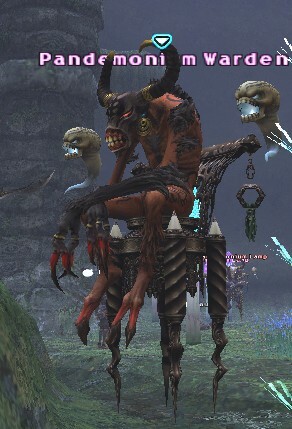 SE might create an artifical limitation as to how often you can kill the monster (be it time or limitations to how many points you can get in a day, or something else). We can never be sure when it's SE we're talking about though. They might not go back to this system and try something completely new, but right now anything is possible. Next time I'll talk about the world spawn system that many current and ex-FFXI players might remember as the weakest link of the endgame systems. Today I'm going to talk about Nobuaki Komoto, the director of FFXIV and his last work Chains of Promathia expansion (and a little bit of FFIX too- the first Final Fantasy he worked on!). Before starting to direct the 14th installment to the Final Fantasy franchise, Nobuaki worked on as an event planner and scenario writer for FFIX and parts of FFXI- mainly the missions and quests for the Bastok city storyline. Later he was chosen to be the director of the second expansion to the FFXI, Chains or Promathia. One can clearly see his influence in how the expansion turned out, however unfortunately the lack of experience he had in directing games as well. The emphasis in Chains of Promathia (from now on CoP) is clearly put to story and missions. Huge part of the development time was put to mission and story content- actually one could say that the whole expansion is centered around it. This is no surprise, seeing what his earlier role was in the making of games he was a part of. One interesting thing to note in CoP is that almost every area in it has been developed for the storyline purposes, and has quite few interactive elements included: In one mission for example the player has to climb up a mountain in a way that resembles more the gameplay of Crash Bandicoot rather than an MMO. Later the player has to also slide down an icy slope. The whole expansion, at times, feels like a single player RPG with multiplayer elements rather than an "MMO". I think that this is what mr. Komoto was aiming for when making the expansion, too. However, unfortunately that was also the downfall of the expansion- it focused too much on a sector which wasn't really a part of the core of the game. While missions and quests were a something that made FFXI unique to other MMORPG's, one does not need to complete them to progress their character. When the main way of progressing character was fighting monsters for experience and doing events for good rewards, the missions weren't as important to most of the players. Pair this with the insane difficulty for some missions, and you have lots of players not bothering with the missions at all, the main part of the whole expansion! 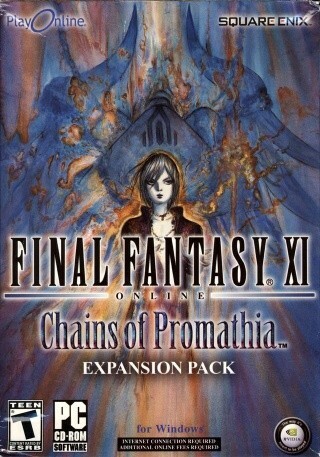 Chains of Promathia, the second expansion for Final Fantasy XI. Later on, after the dev team had finished implementing the missions they could focus on actual content that has something to do with the "core" gameplay of the game, which saved the expansion from being a total failure for many. That is what I think Komoto forgot when directing the expansion, and focused too much on what he knows best: event planning and scenario writing. So, why did SE decide to make the director of FFXIV the same guy who made the not-so-popular CoP expansion? It can't be because it was successful, because it wasn't.. so what could they possibly have in mind? 2. FFXIV - A story driven MMO!? I can only assume that the higherups in SE HQ liked what they saw in CoP, but realized that the core of the game was too far from one that could allow this kind of expansion to be made- missions and quests weren't really a part of the everyday things players did in FFXI, like leveling. So, what if the whole game was designed in a way that it would allow missions to be linked to the character progression and maybe things like endgame and crafting? It'd interesting to see how it would work out at least..! What did the dev team say in the Q&A session at E3? "We wanted to make the best FF game first, and decided on making it an MMO after that." Many theories can be made from that comment, but when looking at CoP- that almost felt like a co-op single player FF at times- one could come to a conclusion that they're trying to implement the missions into the game in a way like never seen before in an MMO. "In FFXIV we hope to expand the system from FFXI and have your character develop- through the story"
Sounds exactly like what he would say! Well, there are still things we don't have answers for- like how does one implement grind to that kind of MMO, or if there will be that at all. No matter what though, there has to be some time consuming process included or we'd clear the content way too fast- be it grind or something else. Only time can tell. 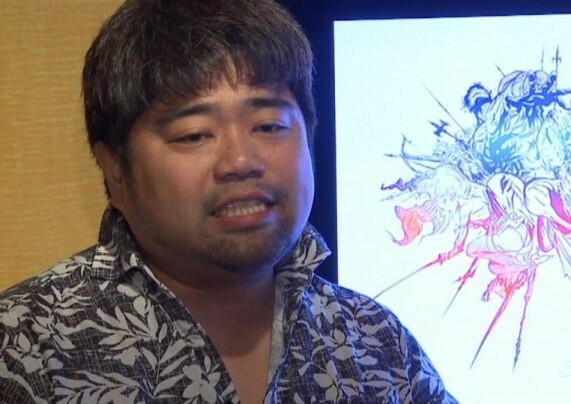 That's all about Nobuaki Komoto- next time I'll talk more specifically about the endgame (and low and midgame) of FFXI and what we could expect from FFXIV endgame- camping monsters for hours with 100 other players in a small zone, or diverse instanced events that do not include camping at all?! First I'll look at how other MMORPG's handle the progressing of the character- these days often called leveling. Most of the time you can solo all the way to the level cap with ease. The difference between grouping and soloing isn't massive. Soloing is done in the same manner as grouping: killing monsters alone most of the time, and doing simple quests. It is very possible that FFXIV might break from this trend, and try something quite different instead. Where do I base my assumption? For the answer to that we need to look at FFXI and how it has developed from a 99% grouping game to a more solo friendly one. For one, FFXI has implemented the so called Fields of Valor system- basically a renamed event for "questing" in other MMORPG's; you kill a few mobs and get extra experience. There isn't much difference between this system and other MMO's questing systems. However, what I think SE will use later instead of the oh so popular quest system is something they implemented in their 3rd expansion pack, Treasures of Aht Urhgan and continued in the 4th expansion: Large scale battles that are always available and where one doesn't need to group up to get decent experience. In FFXI the event could be better; Ps2 limitations are holding it back from being something mindblowing. However, that's where FFXIV comes in: with the PS3 capabilities it could become something really epic. Especially if the game is actually designed around it, instead of trying to implement it into a system not designed for that kind of encounters. There is one more reason for me to assume this; the development team has always been a fan of grouping up. It might not be unreasonable to say that they want to keep the grouping aspect as strong as possible, while making it possible for players to get experience (or whatever it is called in XIV) by themselves, although they'd still be a part of something bigger.  As mentioned above, the FFXI (and XIV) development team likes players to team up and play together. That's why the grouping aspect in FFXIV might be given more emphasis than in other MMORPG's. It won't mean that the grouping will be 'forced' like it is in FFXI. It is very likely that it will play a bigger role in XIV than in other MMO's however. How big the role will be is unknown, but expect to see a clear difference. The biggest difference will most likely be in the amount and type of PvP you are going to see in XIV compared to titles like WAR and WoW. There wasn't any open PvP, and the event was very friendly at heart. Grouping was important, and soloing wasn't nearly as effective. The main purpose wasn't to kill the opposing team, but it was more like a "Capture the flag" type encounter. It was a fun minigame to do and not really a big part of the game itself. That is how it will probably be in FFXIV too, although it could be a part of the main game this time. The graphical style in FFXIV seems to continue in the same trend as in FFXI: realistic 'anime' look. More similar to the korean MMO Aion rather than western MMO's like WAR. Nobody knows if the world will shape up to be zone-based like FFXI or an open world area like WoW. Knowing SE's track record, I'd probably say that they will keep zones around, however make the loading times smaller and the zones bigger in size, as well as more open. A significant difference between other MMO's and FFXIV will be that you can change classes with the same character, and that there won't be race/class limitations like there often are in MMO's these days. One big difference in the endgame structure will be that there will be less events released, but they all add up because nothing gets replaced. The drop rates will be lower than usually, but because there's so many events you can do after a while it won't be much of a problem. The events will vary and there won't be just one type of event to do. Gear progression at level cap will be horizontal, and full of sidegrades. The dev team doesn't communicate with the players as much as the western developers do. They like to hide things as long as possible, and answer to questions with "We cannot tell you at this time." They do take feedback from the players, but often implement their suggestions in a way nobody would have expected: they're still developers after all, just copying ideas isn't good enough! That is all about the differences between the MMO's for today. Next time I'll talk about the director of FFXIV - Nobuaki Komoto and his last work, the "Chains of Promathia" expansion for FFXI. Hello everyone, my name is "Hyanmen" and I am the writer of this FFXIV blog which will give insight as to what can one expect to see in this upcoming Square-Enix MMORPG. The blog will consist of mainly speculation and analysis based on the changes seen in Square-Enix's (from now on SE) first MMORPG Final Fantasy XI, as well as the news and interviews about the subject. If you haven't played FFXI past level 10, here you can find out what kind of game it really is- and if it will affect FFXIV and how. Since the development team has said in the Q&A session of E3 that FFXIV will differ significantly from it's predecessor, there is not much sense to try to speculate in much detail about the things such as crafting or leveling, since those will probably see the biggest changes compared to eleventh Final Fantasy (even then I'll take a brief look at them, if just to give insight how they work in FFXI to give a general idea). There is still lot to talk about however, such as the endgame structure and the possible similarities between the 2 titles, so I'll put my focus on talking about those subjects until more info is released in September. 1) While the game will be different from FFXI, the general direction seen in the MMO will stay as it is or change slightly. 2) The development team will use ideas implemented in FFXI someway or the other in XIV. Tomorrow I'll start the blog by talking about what differences one could expect in FFXIV compared to other popular MMO's such as WoW, WAR and Aion- if there even are any.